Out of mustard, dislike the flavor or cooking for someone who's allergic to it? Use one of these mustard substitutes to get dinner on the table, without a trip to the store. If you have mustard in the fridge, but you just don't have the particular mustard that your recipe calls for, you may be able to make a swap. Replace yellow mustard (which has a fairly mild taste), with the next mildest mustard that you have. Dijon mustard is probably your best bet if you have it. A flavored mustard would also work, as long as it's a flavor that you think will play well with the other ingredients in your recipe. 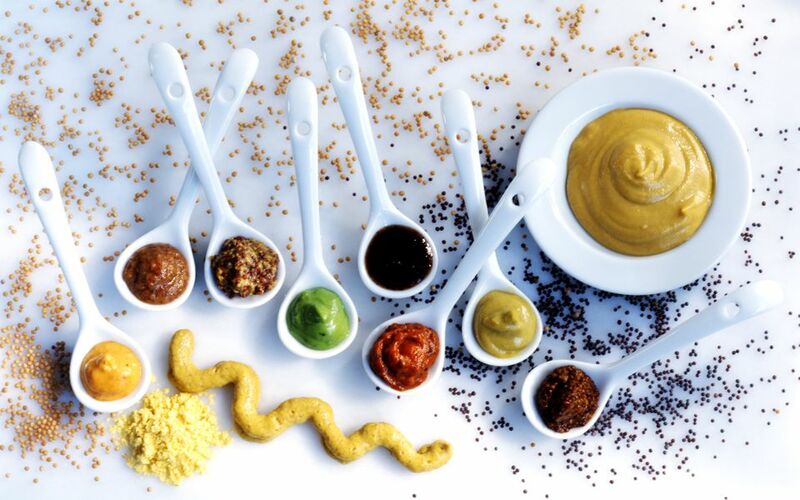 To replace Dijon mustard or spicy brown mustard, stone ground mustard is the best option, but milder yellow mustard would also do in a pinch. Mustard has a shelf life of around a year, once it's been open, so be sure to check the date on any bottles that you haven't used for a while. If you have dry mustard (also referred to as ground mustard) in your pantry, making your own mustard is a cinch. Just combine one teaspoon of dry mustard with one teaspoon of vinegar and one teaspoon of water. Allow the flavors to develop for 15 minutes. Then, use in place of one tablespoon of prepared mustard. This basic, no-frills mustard recipe works well as a stand in for yellow mustard, and will work for spicier mustards (dijon/spicy brown mustard) in a pinch. Out of dry mustard, too? Grind mustard seeds to create the dry mustard that you need for this substitute. White or yellow mustard seeds have a mild flavor (they're used to make yellow mustard). Brown mustard seeds have more of a bite. Black mustard seeds have a strong flavor, and make the hottest mustards. Be sure to consider heat, when choosing which mustard seeds to use. If you don't have the ingredients you need to make your own mustard, or you need to omit the mustard from a recipe to accommodate dietary restrictions or personal tastes, there are other ingredients that you can use in its place. To make a successful substitute, it's important to consider how the mustard is being used in the recipe. Mustard adds flavor to a dish, certainly, but it may also be used as a thickener or emulsifying agent (something that helps to hold oil and vinegar together). The type of mustard called for is also important to consider. Yellow mustard is fairly mild in flavor, while Dijon or whole seed mustard is far spicier. Taking this into account allows you to pick a substitute with the closest flavor match. For Yellow Mustard - Try an equal amount of mayonnaise. This won't give you the same flavor, but it will maintain the thickness. For Dijon Mustard or Spicy Brown Mustard - Use a small amount of prepared horseradish or Wasabi in its place. Both pack a lot of heat, so just a dab will do it (definitely don't replace it measure for measure). If mustard allergies are a concern, check the label before using Wasabi. It's sometimes made with ground mustard. For Salad Dressings/Vinaigrettes - Omit the mustard from vinaigrettes. The oil and vinegar won't hold together as well, but it'll still taste good. For salad dressings where mustard is a main ingredient (i.e. honey mustard), it's best to choose another recipe, until you can get to the store for more mustard. For Cooked Dishes - If the recipe only calls for a small amount of mustard, you can usually get away with skipping it. This is especially true when there are other herbs and spices in the dish. Whip up a quick batch by mixing equal parts yellow mustard and honey, or grab a bottle of honey mustard salad dressing out of the fridge. Don't sweat it. Here are some things that you can use in place of dry mustard, also known as ground mustard. If you accidentally get mustard on your clothes while you're working on your recipe, this stain remover trick will get it out. What Can You Use Instead of Dill? Out of Vinegar? Find the Perfect Substitute! Out of Brown Sugar? Here's How to Make a Simple Substitute. Out of Sage? Try These Handy Substitutes! What Can You Use Instead of Beer in a Recipe That Calls For It? What Can You Use as a Substitute for Pastry Flour? What Are Some Good White Wine Substitutes When Cooking?